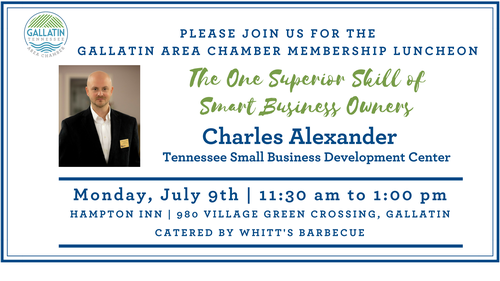 ​Topic: "The One Superior Skill of Smart Business Owners"
Reservation Deadline is always at Noon on the Friday prior to the Luncheon. The cost for Chamber Members is $18 for reservations made by noon on the previous Friday; $20 with reservations after the deadline; $25 at the door. The cost for non-members is $25.